TRUE TO SIZE. PLEASE CHOOSE THE SIZE YOUR GIRL USUALLY WEARS. DO NOT refer to AMAZON's General Size Chart.Size 2T is for average 2-3 year-old girls. Size 3T is for average 3-4 year-old girls etc...Size 5 and up runs SLIGHTLY small. If she is 5.5 years, choose size 6. If she is 6.5 years old, choose size 6X. If she is 7 years old, choose size 7 etc. If she is 7.5 years, choose size 8. If she is in between SIZES, choose the bigger size. 3 piece Christmas Holiday Scarf Set includes: tunic top, matching leggings and scarf. 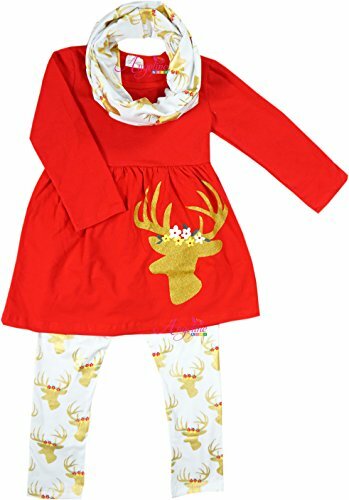 A Christmas applique sewn on the side.The perfect outfit for your little lady to wear to all of the Christmas festivities! 97% cotton & 3% spandex. Exclusive of decoration. Soft and high quality material. Comfy for all day wear in this Fall/Winter- Christmas holiday time. These are top quality and true boutique style outfits! Super comfy, yet so stylish! Machine Wash Cold. Gentle Cycle. Tumble dry at low heat. Do NOT bleach.